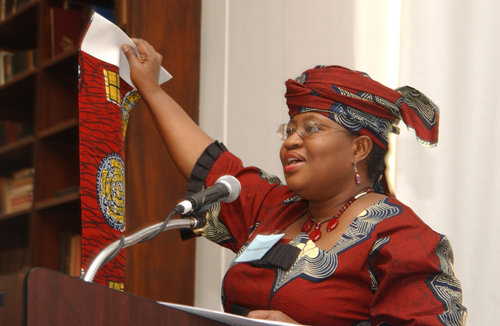 Minister of Finance and Coordinating Minister for the Economy, Dr Ngozi Okonjo-Iweala has criticised the Nigerian educational system, decrying the “ineffective” regulatory structure and constant mass failures recorded during examinations. Speaking in Lagos at the 2012 Isaac Moghalu Foundation Leadership Lecture tagged: “Education and Development: Paradigm Shift,” she criticised the existence of two examinations bodies ( West Africa Examination Council, WAEC and the National Examination Council, NECO ) conducting the same type of examinations for Senior School Certificate. “The regulatory system in the sector is largely ineffective, and this reflects on the curriculum, especially in many private schools of foreign origin. Pupils in many of these schools are taught little or nothing in Nigeria,” she said. I've been saying this. Glad someone in the government has said something about it, it's a sad truth, Nigeria's education system is abysmal.